The weather forecast is calling for one of the most major snowstorms the region has seen in some years. Of course though these days if 2 inches drop it causes the every area TV station to post "STORM TRACKER ALERTS" and so on causing some type of hype and scare-mania for what is just an everyday run of the mill Michigan winter snowfall. None the less, errands and a trek was made to the store for a few things needed in case the weather actually hindered getting out on the roads over the next few days. On my final stop I spotted these Imperial Stouts on the shelf. Knowing their powers from many past years when they make their winter appearance I know that IF we did actually get the snow the weather folk were banging out about these beers would be something to warm me as I watched a tundra happen out my windows. This is one of the darkest beers ever. It looks and pours pretty much like old motor oil. Save from a dark ruby color along the sides of the glass no light gets through this brew. The head is a sliver of bubbly mocha color that, though thin, leaves a fair amount of lacing behind in it's wake. Cocoa, coffee and vanilla notes are what comes through first on the nose. None of them come out blasting in scent. Instead, they are all mellow and roasty as they intermingle with each other. Just beneath them are hints of charred maple, vanilla and tobacco. Very warm and soothing-which is to say it is already starting to do it's trick as I am watching the snow starting to pile up and watching the thermometer dropping down. 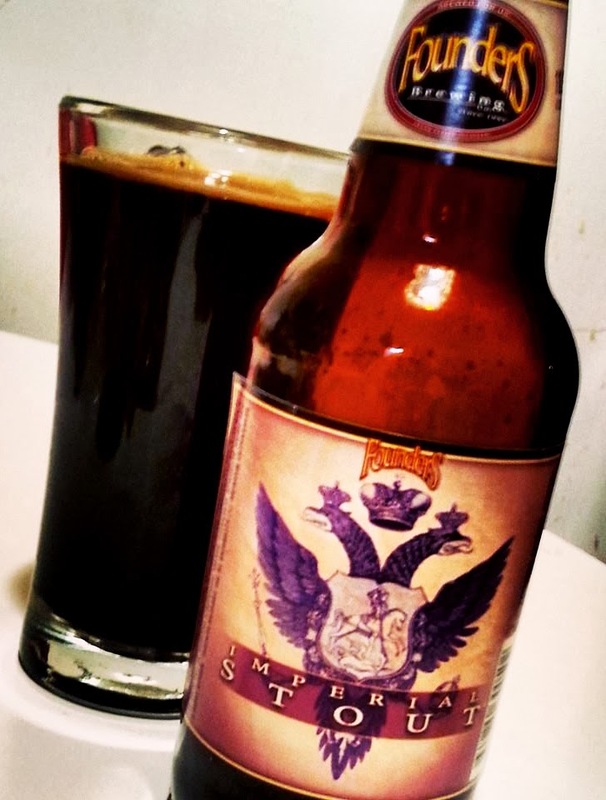 Tastebuds become immersed in dark coffee and bittersweet chocolate flavors at first sip. They hold strong through the soft & chewy nature of the beer but also give room for dints of raspberry, vanilla and hardwood smoke. Towards the finish, where a lot of bold stouts seem will drift off into either a watery sweetness or spent coffee, this takes a bold turn with a piney hop bite and a reminder that even though the 10.5% abv has been well hidden beneath ten varieties of malted barley it still packs a punch. Damn! It is starting to look really monochromatic outside. Maybe the television wasn't actually over-exaggerating the mess this storm is gonna make. Good thing I found a store with this in stock as it is one of the most hearty things ever for such weather nuisances.